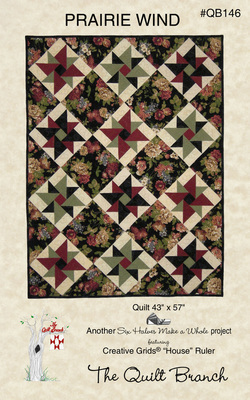 The gentle wind on the prairie inspired this 43" x 57" quilt. A quilt in the Six Halves Make a Whole series, Prairie Wind uses 3 light and 3 dark half-yard cuts and a focal print in your favorite color combination. The House Ruler (required) designed by The Quilt Branch for Creative Girds® makes cutting out this cozy quilt easy and fun.